A New book from Four Ways West on the Illinois Central Gulf Railroad. Featuring all color photos. Presenting interesting reflections concerning the merger of the Illinois Central and the Gulf, Mobile & Ohio Railroads in 1972. The goal is to describe the general operating pattern of Illinois Central Gulf's freight service up until the railroad resumed the Illinois Central name in February 1988. 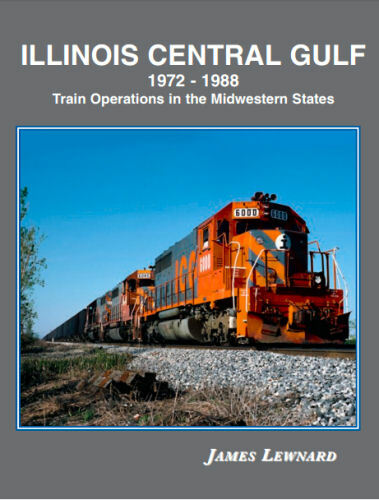 This book examines the operating patterns of ICG trains running in the states of Illinois, Iowa, Missouri, and Indiana. An amazing amount of information and data is enclosed in this title. Hundreds of never before published photographs in color. Hard cover.